Florida Gov. 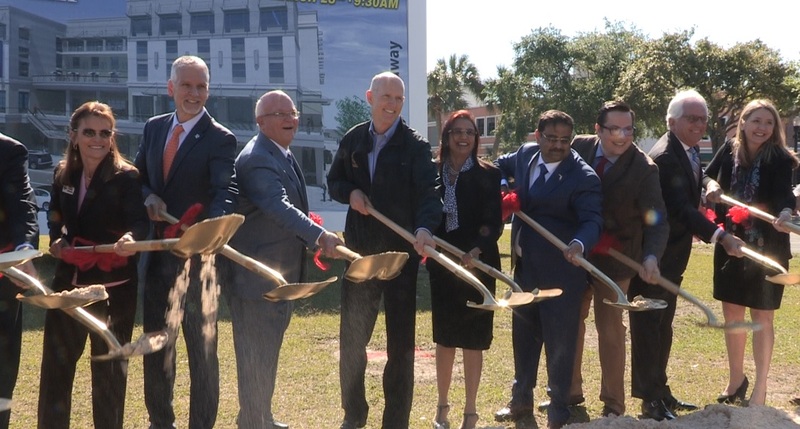 Rick Scott (sixth from right) at the ground breaking ceremony of a new hotel being constructed by Indian American Danny Gaekwad (fourth from right) in Ocala, FL, on March 23, 2017. OCALA, FL: Florida Gov. 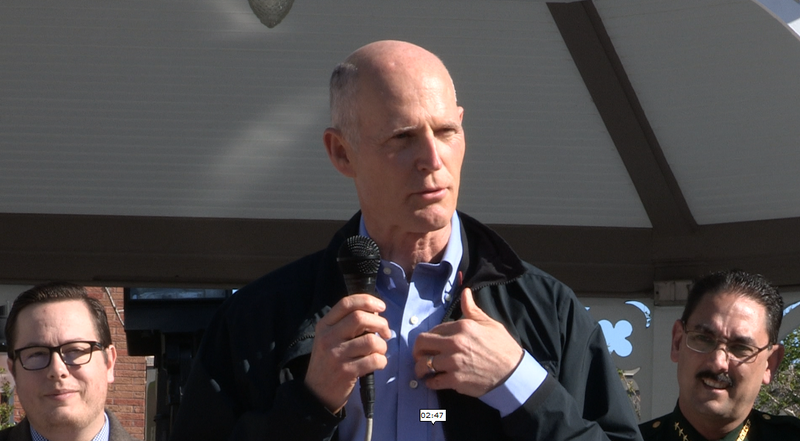 Rick Scott was the chief guest at Friday’s ground breaking ceremony of a new hotel being built by Indian American entrepreneur Danny Gaekwad in Ocala, FL. 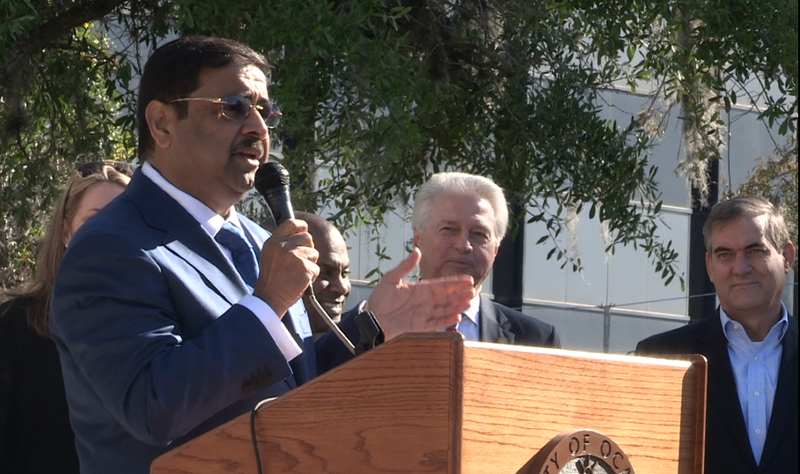 The Republican, who last visited the central Florida city during his first gubernatorial campaign in 2010, was among the dozens of people who ceremonially broke the ground for the Hilton Garden at the Downtown Square. The $20 million, five-story hotel, which will also have restaurants and retail stores, is expected to rejuvenate the historic downtown area. The 1.1 acre lot housed a building that served as the headquarters of the local Chamber of Commerce a couple of decades till the mid-1980s. From 1850 to 1966, there was a hotel at the site before it was demolished to pave way for the chamber building. Gaekwad serves on the board of Enterprise Florida, a private-public group of government and business leaders that is known as the state’s “principal economic development organization.” Scott is the chairman of Enterprise Florida. Other speakers included Cissy Proctor, the director of Florida’s Economic Development Opportunities; state Sen. Dennis Baxley and Ocala Mayor Kent Guinn. “If you need a personal story, living in the back of a discount beverage shop, with a vision of what you can do in America, he is living the dream that we share,” Baxley said. Gaekwad and his wife, Manisha, have lived in Ocala, a town of some 60,000 people, since the late 1980s. They have several businesses in the area, including hotels and real estate properties. Born in Baroda, in Gujarat, he came to the United States in his mid-20s. He has built over a dozen small- and medium-sized companies worth hundreds of millions of dollars, in areas such as convenience stores, real estate development, hospitality industry and information technology. Ocala is the largest city in Marion County and it is the seat of the county government. The greater Ocala metropolitan area has a population of approximately 350,000.